Welcome to Natasha in Oz, dear friends! Thanks so much for stopping by to Say G'day. 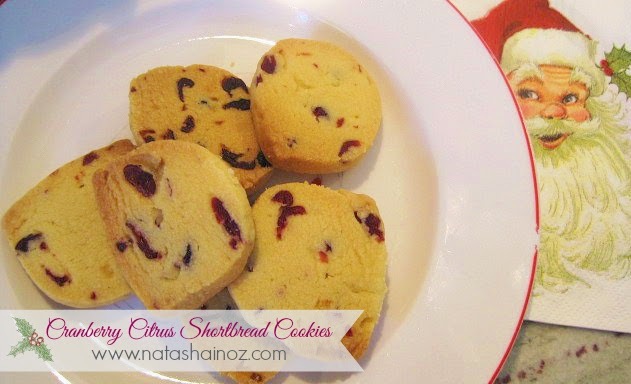 I'm sharing a Christmas recipe this week for Cranberry Citrus Shortbread. 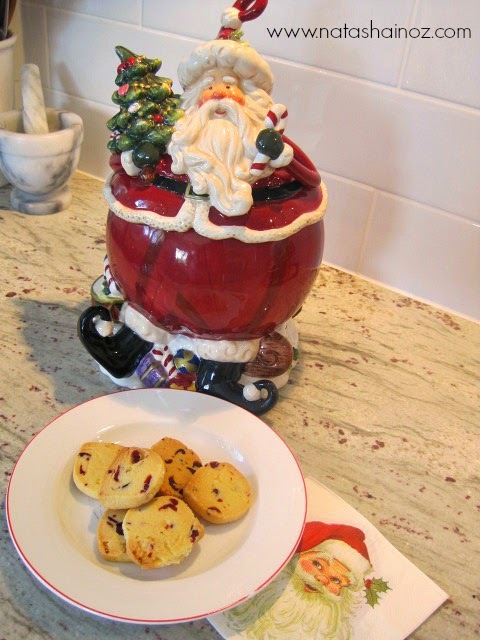 I have shared this recipe before at my Christmas blog but realized just this week that I hadn't posted about them here! These cookies are the perfect Christmas treat and, with the tangy zest of orange and sweet cranberries in the mix, they look so festive and jewel-like when served at the Holidays. The base recipe is so easy and I use it for all of my shortbreads. 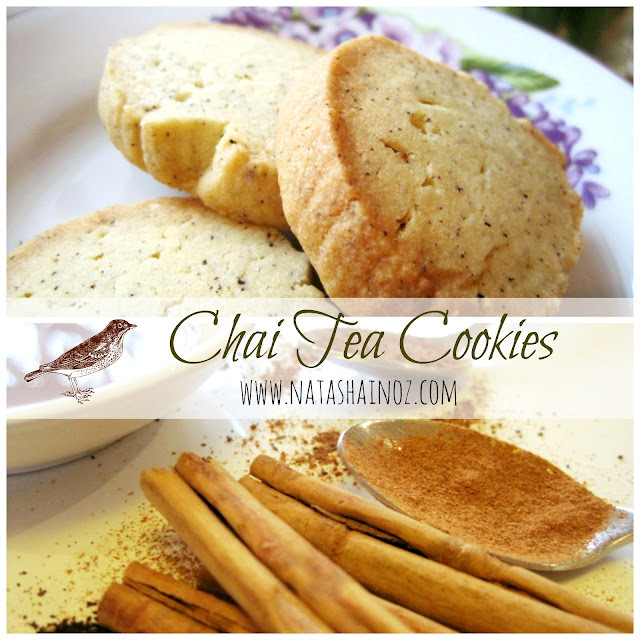 I have posted about my Caramel and Cashew Shortbread Cookie Recipe here and my Chai Tea shortbreads here. This shortbread recipe is so versatile that you can actually add whatever you like. I have added things like dried fruits, nuts, citrus zest, choc chips, lavender and ginger. The options are endless! The other great thing about this recipe is you can freeze the cookie dough ahead of time then slice and bake for holiday parties when you need them. 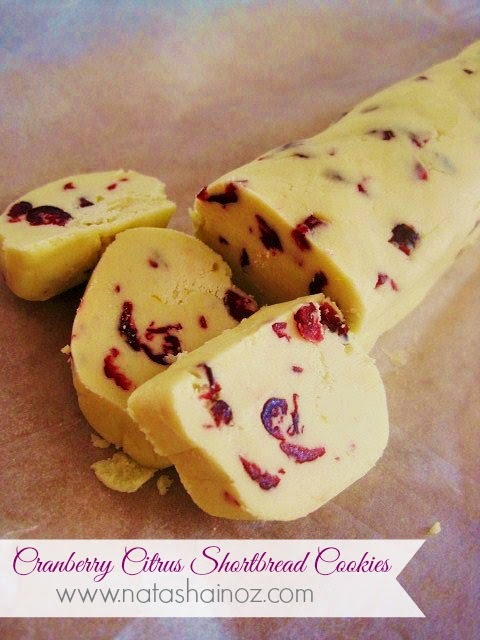 Beat butter with a mixer on medium speed until creamy and smooth, about 2 minutes. Gradually add the powdered sugar, beating until smooth. Add vanilla, almond extract, orange zest and dried cranberries and beat until combined. Reduce speed to low. Mix flour, baking powder and salt. Gradually add flour mixture to butter beating at a low speed until blended. Form dough into 2 logs, each about 1 1/2 inches in diameter; wrap in parchment, and refrigerate 1 hour (or up to 3 days). Preheat the oven to 350 just as the cold cookie dough comes out of the refrigerator and you are ready to bake. If the dough is frozen, let the logs stand at room temp for 10 minutes. Now remove parchment and slice logs into 1/4-inch-thick rounds. Space each cookie about 1 inch apart on baking sheets lined with parchment. Bake until pale golden, about 12 minutes. Keep an eye on the at all times-they can overcook very quickly! Let cool.and enjoy! They can be stored in an airtight container for up to 1 week but I doubt they will be around that long! 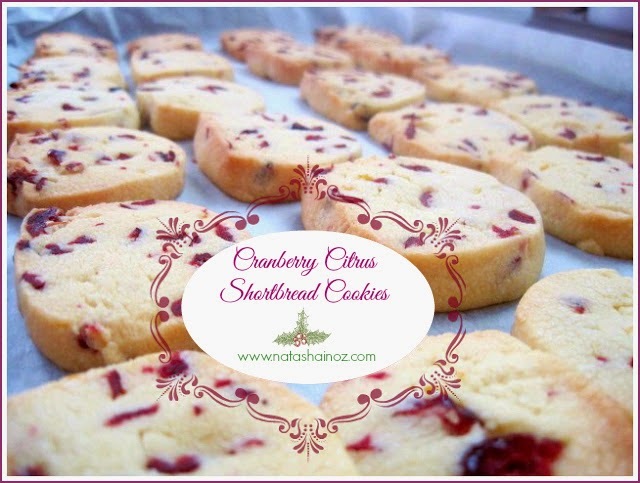 These Cranberry Citrus Shortbread Cookies would be make a wonderful gift and a perfect addition to your Christmas celebrations, cookie swap or holiday party. I hope you will give them a try these holidays! 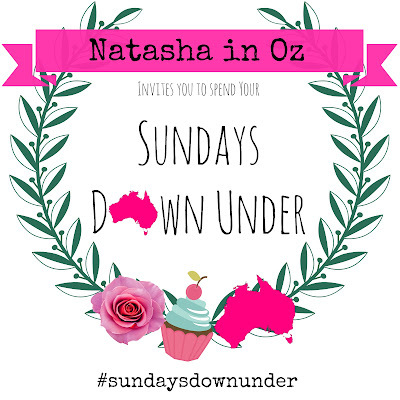 Don't forget about the Sundays Down Under linky party which starts on Saturday evening in the US and Sunday morning Down Under. Hope to see you this weekend!